WSG has responded to the governor’s Washington State Blue Ribbon Panel on Ocean Acidification by offering print and online outreach materials on acidification, conducting frequent public presentations, and working with NOAA to produce monthly webinars. 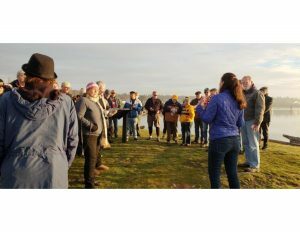 An online collection of ocean acidification (OA) curricula for K-12 classrooms is available and, in partnership with the Puget Sound Restoration Fund and Suquamish Tribe, WSG is helping the Bainbridge Island School District to incorporate OA course and fieldwork into their high school environmental science classes. The SoundToxins partnership was conceived and initiated by the Northwest Fisheries Science Center (NWFSC-NOAA) but is now co-directed by WSG. SoundToxin’s roster of partners has grown from four in 2006 to 23, some of which monitor more than one site along Puget Sound. The SoundToxins program aims to provide sufficient warning of harmful algal bloom (HAB) events to enable early or selective harvesting of seafood to minimize risk to human health and reduce economic losses to community stakeholders such as Puget Sound fisheries. SoundToxins is a robust citizen science project involving hundreds of community members that regularly document unusual bloom events and new species entering the Salish Sea. WSG specialists provide volunteer coordination, training and communication services for SoundToxins. To ensure volunteers have current information to help with monitoring, the SoundToxins Manual was revised in 2016. While much of the material is highly technical, this manual also can help educate lay readers about HABs. The European green crab (Carcinus maenas) is considered one of the world’s 100 worst invasive species. Its impacts on the Washington Coast appear to have been minimal to date, but its potential effects on inland ecosystems are uncertain. Following the discovery of green crab just west of Victoria, B.C., in 2012, WSG teamed up with the Washington Department of Fish & Wildlife and other partners to establish a volunteer monitoring program — the WSG Crab Team — in Puget Sound, the San Juan Islands and the Strait of Juan de Fuca. This program works in tandem with an outreach campaign to increase the likelihood of detecting green crab infestations early. 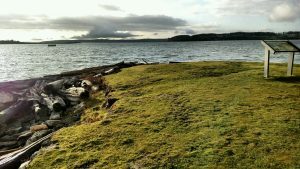 After the WSG Crab Team detected the first green crab on San Juan Island in 2016, they expanded to 54 monitoring sites. Additional green crab were subsequently found in Padilla Bay, Sequim Bay and Whidbey Island by WSG Crab Team and volunteers or professional agency or tribal staff that were advised by the team. These are the first confirmed captures of green crab along Washington’s inland shorelines. Such early detection offers the best chance for controlling the green crab and protecting important natural resources. Learn more about preventing a crustacean invasion.